Pool heating systems warm your pool by multiplying the normal heating effect of the sun. Your existing pool pump is used to pump filtered water through a solar water heating panel (angled on a south facing roof or structure) and return it directly to the pool. There is no additional tank required. In warm climates, your solar pool heating system can be used to cool your pool by circulating pool water at night (which disperses the heat). If you are considering a solar pool heating sytem, it is highly recommended that you use a professional installer. 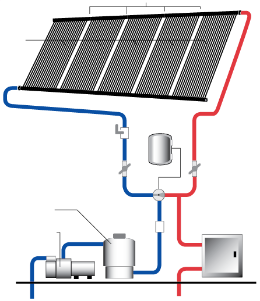 Licensed and insured pool heating contractors will ensure the efficiency of the system and safeguard the warranties offered by system manufacturers. A solar pool cover can help you retain much of the heat generated by your solar pool heater. It's a great investment that will pay for itself in very little time.